Commentary: This story is part of the broad movement away from shallow, contaminated urban wells towards central water supplies that had been going on in the US for 20 years. If Bridgeport added chlorine to their new water supply, death rates would have plummeted. 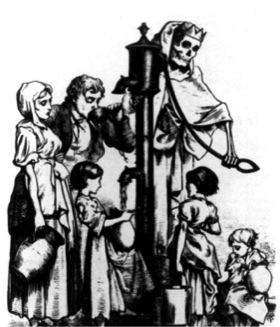 This entry was posted in Year 6 TDIWH and tagged drinking water, epidemics, public health, water, water history, wells on April 16, 2018 by safedrinkingwaterdotcom.